Following a devastating Category Four hurricane in 1919 that destroyed its downtown, Corpus Christi filled a block into the Corpus Christi Bay to construct a new seawall that would protect the community from future disasters. 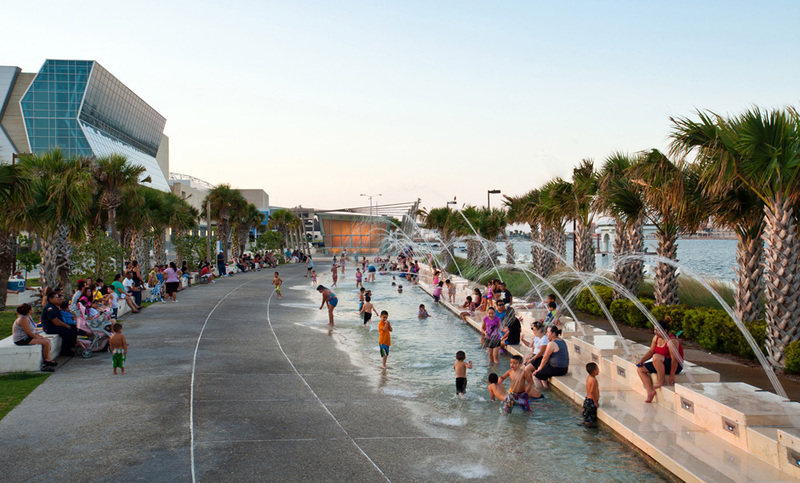 Since that time, the bayfront has been defined by Shoreline Drive—a wide boulevard designed primarily for automobiles—and provided limited spaces for pedestrians in the hot South Texas sun. In 2004, Gignac Associates and Sasaki prepared the overall master plan for the Corpus Christi bayfront—spanning from McGee Beach in the south to the ship channel in the north. The approved master plan called for the relocation of Shoreline Boulevard in order to accommodate new green spaces along the water’s edge, thus creating the vision for the new North Bayfront Park. Situated next to the American Bank Center Arena, North Bayfront Park is the first of a series of parks to be constructed from the master plan.